Patented synbiotic blend includes Inulin, Acidophilus, Bifido, Strep. thermophilus and 3 unique strains of Lactobacillus Bulgaricus. The presence of Inulin (prebiotic) greatly aids the reproduction of friendly bacteria (probiotics) when they are reactivated inside the gastro-intestinal system. 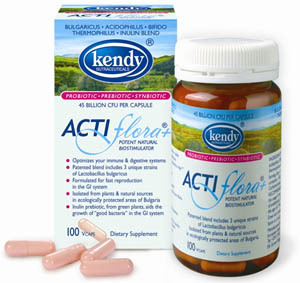 Each capsule contains at least 45 billion viable lactic acid probiotic bacteria at time of manufacture. Supplied in nitrogen filled, non-porous bottles for longer shelf life. All natural - Vegetarian safe.